If like me you love using fresh herbs in your recipes then at this time of the year choice can be limited. You can buy plants at the supermarket but they are often lacking in the taste you would get from your own herb garden in the summer. But if you have a bright windowsill there's no reason why you cant grow a selection even in the depths of winter. Many herbs will grow quite happily in pots and only require a little bit of care. However, you must bear in mind that to have enough to really use in your cooking, you will need good sized plants and correspondingly the pots to plant them in, so make sure you have enough space to keep them. 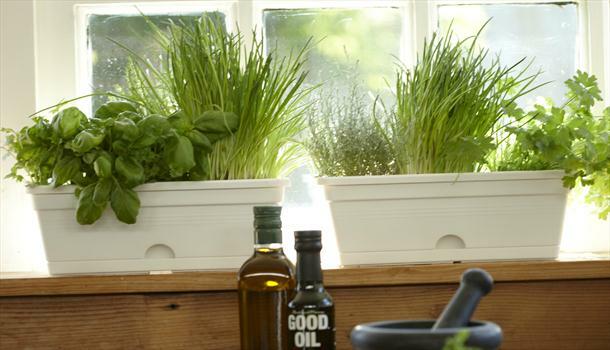 If you can do, you'll be using fresh herbs in your kitchen all the way through the winter months. A south or Southwest facing window is best. Avoid windows with a radiator underneath if you can, or if not keep on top of watering, don't let them dry out but don't waterlog them, remember many herbs come from Mediterranean climates so don't like constantly wet feet. Use a soil-less compost medium to avoid introducing soil borne pests, don't use soil from your garden. Ideally use a container that is at least 6 inches deep, but more if you have space. If starting in winter buy plants from the supermarket that are sold as fresh herbs and grow them on, if you start in the summer you can also take cuttings of your favourites from the garden such as sage or rosemary. Feed you herbs monthly with a suitable plant feed designed for edible plants. I tend to use a slightly weaker solution than recommended for best results. Great plants include, basil, mint, parsley, sage, rosemary and thyme, if they get too big then plant them in the garden the following spring and start again. I always believe that we should share these types of useful and informative article so that all the people can increase their knowledge and can solve their problems.Thanks a lot for sharing!